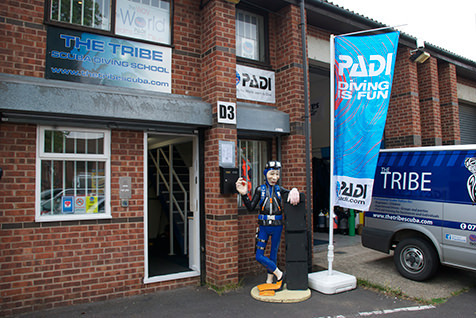 The Tribe is Nottinghams longest established PADI Dive School. Each year we introduce thousands of beginners to the exciting underwater world. Our mission at The Tribe dive centre is to be the best. That means the best instructors, top quality equipment, small in-water groups and caring, patient tuition for everybody. Our holidays are designed around our divers. We encourage couples, singles and families, novice divers, experienced divers and non-divers. We always ensure that you become part of The Tribe with as much or as little help as you need. If you are taking a course on of our holidays, one of our instructors will be teaching you and you can rely on our high standards. Our diary is always full. A busy summer week for us means approximately 400 students completing Discover Scuba sessions, over 30 hours in the pool, and a day or two in open water. This means that our instructors get a lot more experience than the average instructor. Our new dive shop is growing and improving. It opened in March 2011 to cater for divers in the Midlands and our aim is to give good honest advice backed up with years of experience. We like to sell our customers the equipment that they need and will get most enjoyment from. The Tribe doesn�t only confine itself to recreational diving. Our Technical team, led by Martin Jordan is growing and starting to spread its wings. We also boast a busy First Aid training team teaching divers and corporate clients the full range of first aid courses from basic first aid to instructor training.